Are Textalyzers Coming to Town? Are "Textalyzers" Coming to Town? Do you text and drive? There are now even more reasons to put your phone down. A recently proposed bill by New York state lawmakers would require all drivers involved in a collision resulting in injury, damage, or death to surrender their mobile device to police to be scanned by a new piece of technology called a "textalyzer." Ben Lieberman, co-founder of the Distracted Operators Risk Casualties (DORCs), helped to produce the legislation. The bill, called Evan's Law, was named after Lieberman's 19-year-old son who died in 2011 after suffering from injuries in a car crash, as the result of distracted drivers. Distracted driving has been a battle for numerous states that have implemented new laws against the use of cell phones while individuals are behind the wheel. Unfortunately, these texting bans have not encouraged all drivers to put their phones down. According to the National Center for Statistics and Analysis, more than eight people are killed and 1,161 injured in crashes that involve a distracted driver. The "textalyzer" would be used by officers to plug into the phones of drivers causing collisions. It will detect whether the driver was using the mobile device to text, email, or other activities that are illegal under New York driving laws. The new technology is being developed by Cellebrite, an Israeli firm that has a U.S. office based in Parsippany, New Jersey. Cellebrite has provided the FBI with similar devices used to scan the contents of media devices. It's already clear the law will be challenged in court by privacy advocates. Some critics of the "Evan's Law" are concerned that the "textalyzer" could violate the Fourth Amendment right to a reasonable search and seizure. In response to these privacy concerns, Cellebrite ensures that the "textalyzer" will be used by police officers to detect mobile device activity around the time of a crash. Content such as contact information, phone numbers, photos, conversations, and applications will remain private. Since driving is considered a privilege and not a right, the "textalyzer" would be treated similarly to a Breathalyzer. States could suspend or revoke your driver's license, impose fines, or even put you in jail for not submitting to a "textalyzer" test when suspected of distracted driving. The "textalyzer" would fall under the Implied Consent Law, so if drivers refused to be tested by the device, they would surrender driving privileges, just like a Breathalyzer. Evan's Law was approved 16-to-2 by the New York Senate's transportation committee in March 2016. The bill still awaits a vote from the entire Legislature. At Edgar Snyder & Associates we see first-hand the devastating results of distracted driving. Evan's Law is a new proposed bill that is pushing to help keep those on the road safe. Know statistics regarding cell phone use. 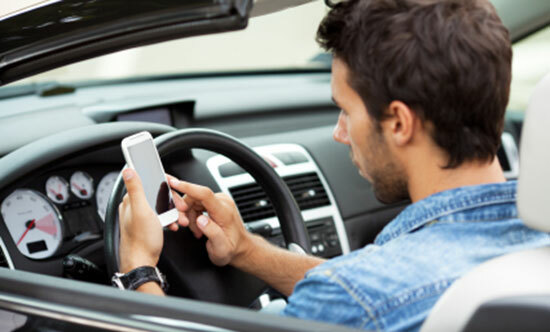 Understand Pennsylvania's laws regarding driving and cell phone use. More attention has been drawn to the increasingly fatal results of distracted driving. The National Safety Council found that in 2013, a minimum of 27% of crashes involved drivers talking and texting on cell phones, and with new applications and faster phones, we can expect this number to increase over time. Until there is a remedy for all distracted drivers, Edgar Snyder and Associates is here to represent victims injured in accidents resulting from distracted drivers. Contact our law firm for a free case review. We will answer your questions and determine the best course of action for you. There's never an obligation when you call — just legal help when you need it most.